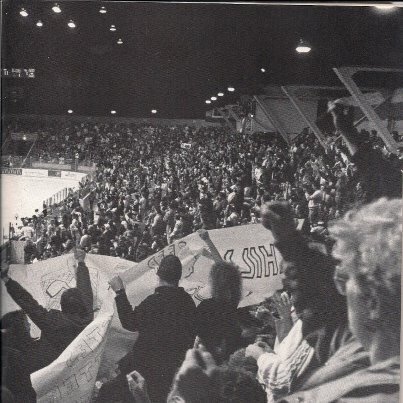 The 6,000 seat Ohio Expo Center Coliseum was a structural symbol of what made Columbus unremarkable when the Chill opened play in the early 1990s. Built at the end of World War I, in 1918 to be precise, making it the oldest professional hockey arena in North America. The locker rooms and restrooms were inadequate, the hallways were way too narrow, there were no real amenities to speak of and the parking sucked. To be kind, when the Chill launched the franchise in 1991 the facility had seen better days. But the Chill saw a beauty in the Coliseum. Once fans were in their seat they were treated to perfect sightlines. With just over 15 rows of seating, no one was far from the action, a critical attribute in hockey that resonates with the fan when close to the ice. The facility had a low, arcing roof that magnified the sound. Plus there were ample space at the top of the stands and in the corners for standing room. Put a few thousand in the barn the place would feel full. Pack it, and it had the potential to rock. A big problem, though, was that as one of only a few decent sized facilities in the market the Coliseum was booked solid with events. From day one through the team’s eight-year existence the Chill had problems with securing dates as well as operational issues. Nicknamed “The Barn,” the Coliseum has become a legendary and traditional High School Basketball venue. It was also once upon a time home to the Ohio State University men’s basketball team, and a number of professional sports teams (Columbus Thunderbolts, Arena Football League team; Columbus Horizon, Continental Basketball Association) and three previous hockey failures (Checkers, Seals and Owls) prior to the Chill. The Coliseum continues to remain very active and is the home to the OHSAA central district and regional playoffs in boys’ High School hoops. The facility was renovated in 2005 to include new scoreboards, the addition of shot clocks above the backboards, a fresh coat of paint, and new rest rooms.